Knowing that you are an artist must be the first stein marketing your art. Defining who you are as an artist should be your first priority. In person, Kathy is often jovial and playful. No matter what she is doing, she maintains an exuberance about life and frequently puts a humorous emphasis on her interactions with friends and colleagues. 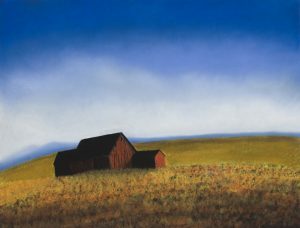 … Stare at one of Kathy Beekman’s pastel paintings for long enough and you’ll feel at peace. The uncluttered landscapes, combined with contrasting warm and cool colors, draws the viewer into the canvas. It’s hard not to yearn for a time machine to transport you to the field where there’s just a big sky, a rolling sea of grassy plains and a lone brick-red barn in the distance.